What is a foodie penpal you ask? Well, again via twitter, which Nina Garcia from Project Runway just tweeted to me, "Twitter is a new way of making friends", I found Lindsay at the Lean Green Bean. She was tweeting about this Foodie Penpal Program and it sounded interesting to me. So February was my first month to try this and I must say it was quite fun! I love buying things for others and introducing those to new products. This program started in Sept. of 2011 and as of February 2012, Lindsay had over 200 participants! It sounds to me like it is a huge success. 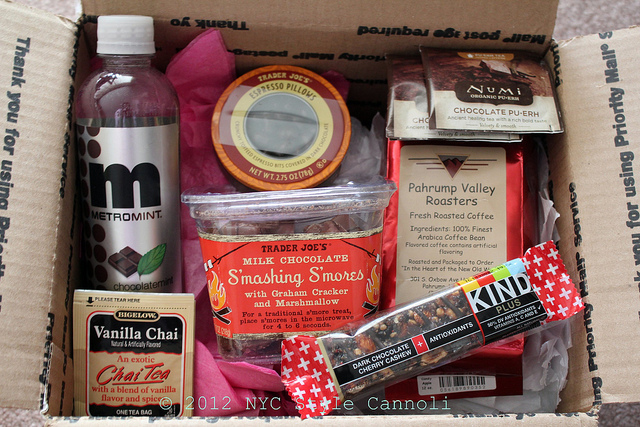 It is fun to know you are having a package full of goodies come your way! My box went to Annica and her blog can be found HERE. My goodies came from Brittany in Las Vegas. My box had lots of my faves in it and many I have never tried. The Numi Chocolate Tea I have heard of but never tasted so excited about that for sure. The Vanilla Chai I have in my kitchen and love it especially with some milk in it. Metromint Water sounds really interesting and I am excited to try that as well. The Candy Apple Coffee sounds really wonderful and I have yet to look up the company that makes it to see if they ship. 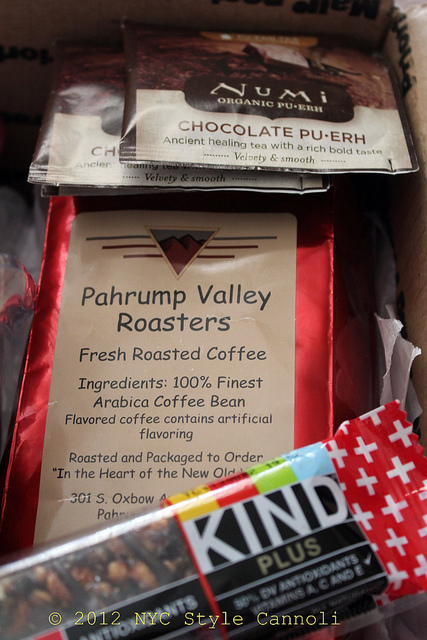 They are made in Las Vegas, which I was glad to receive something from Brittany's home state. 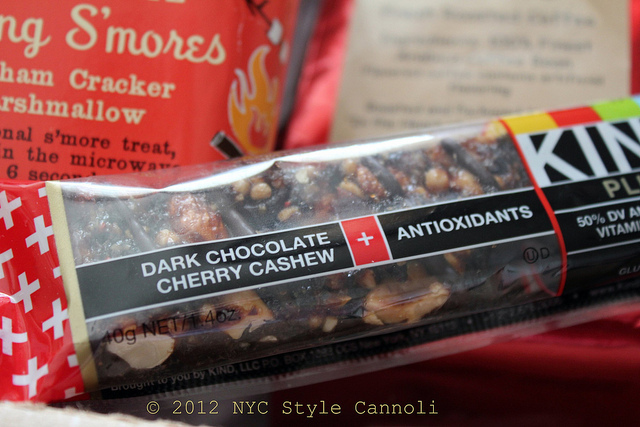 The Kind bar sounds really wonderful and I have had other flavors from this company but not this one!! I love Trader Joe's but have no stores in my hometown. 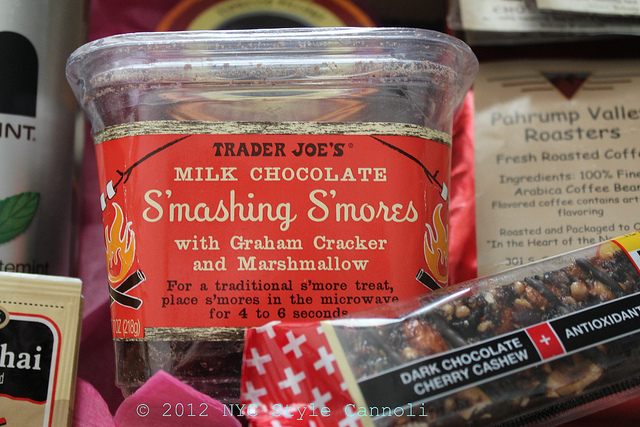 These Smores look great and you can even microwave them, oh boy, excited to try these soon!! Even though I love coffee, not a fan of chocolate covered coffee beans but these are not too strong. They pretty much melted in my mouth. This was a real fun item to try!! I must thank Brittany for all my wonderful items in my goodie box! I enjoyed this very much, not sure if I will participate every month, but maybe every other would be fun. -WHETHER YOU ARE A US RESIDENT OR CANADIAN RESIDENT. – this is SUPER important so I can get you on the right list! Thank you to Lindsay for thinking of this great concept. A way to meet new friends and try new foods is always a plus on my list!! dang!!! you got the hookup. i need to try those smores. Those smashing smores sounds amazingly good! Wow, that is really interesting!!! Have a beautiful evening! This sound's like so much fun. I can't do it this month but maybe next month. Would you do it again? I wish Austin, TX would get a Trader Joe's. Then on second thought..maybe I don't. I would do it again but am passing for March. I think the summer may be a challenge as you cannot do anything that may melt. It is a really fun event to participate in at least once. Thanks for that imput on it. I didn't even think about something melting until you wrote that. Actually winter has finally arrived in California just this week. Crazy! Have a great evening. What a fun idea! 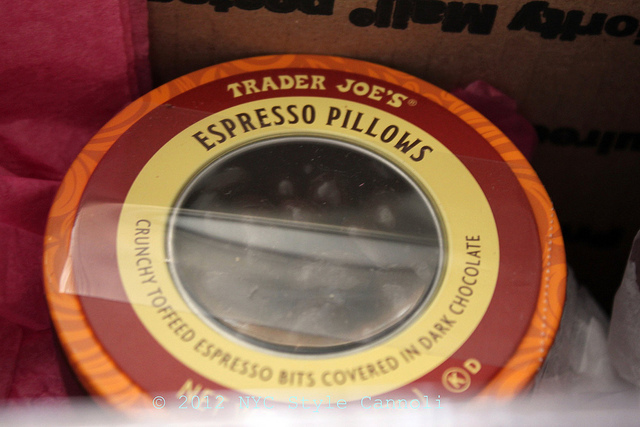 I love those TJ's espresso pillows and the KIND bar is my fav. Blogged about it recently. I may have to try this idea.